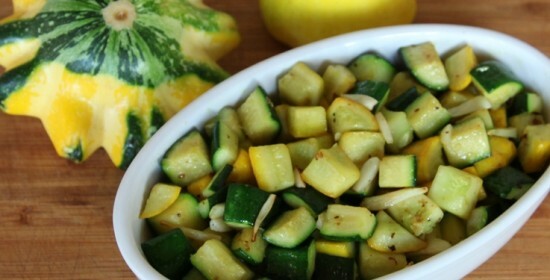 Wash squash and cut into small pieces. Peel the garlic cloves and slice them lengthwise then slice them into thins strips. In a large frying pan or skillet add a little oil and heat on medium. Add squash and garlic and saute until squash is lightly browned. Serve. You can also mix the squash and garlic with oil and spread in a thin layer on a baking sheet and bake in a 350 degree preheated oven for 10-15 minutes, turning the vegetables over once during cooking.